Hamby Home(in)stead ...: Don't rubbish my trolley! I like trolleys! When we moved to Melbourne my trusty picnic trolley was left in storage. On one of our early zoo visits I spotted a bigger and better version, sort of like a mini shopping trolley. I found mine at a shop near the Queen Victoria markets. It's very nifty and we've used it a few times since purchasing, though Nick needed to make a couple of modifications. It was a bit big to take on the trams though, so I also purchased a modern shopper a few weeks later. When we lived in the apartment the shopper was good for carting books back and forth to and from the library - and we used it for Vaughan's swimming lessons on occasion also. One of our first purchases after picking up the keys was another trolley - a tipper version for garden missions. Nick did point out that it was my third trolley purchase in as many months - and my fourth trolley overall! Aside from it's intended use of carting garden waste, it was actually quite useful for moving furniture. I expect it will be just as good for carting firewood or shifting rocks from the paddocks. We found another use for it today. 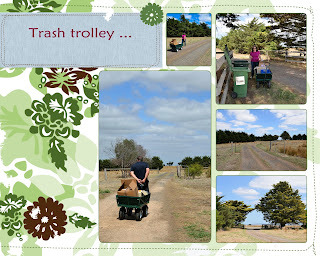 Our rubbish bins live at the front gate, about 300 metres down the driveway from our house. 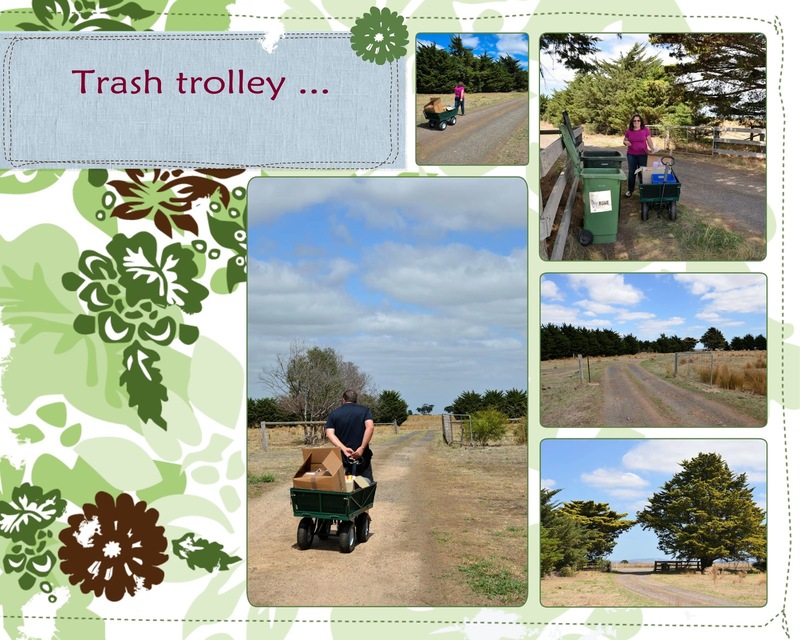 I generally put rubbish/recycling in the car to be dropped off as we drive out on other missions - but today Nick and I loaded it into the trolley instead and then went for a brisk(ish) walk down to the front gate. We could fit a few boxes in the cart quite easily, so I think trolleying trash might become a regular event!